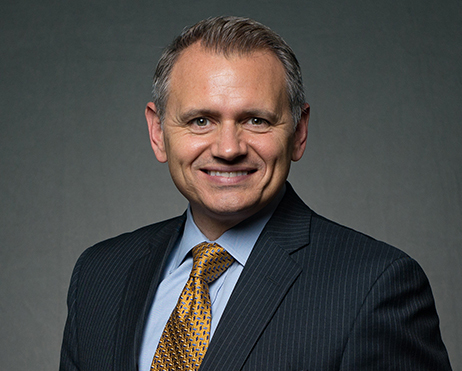 As a trial lawyer and current member of the Executive Committee, Tony has considerable experience representing clients both in the courtroom and in all aspects of litigation through trial. He is budget- and expectations-oriented, giving his clients weekly updates on their cases so they understand what has happened and what is upcoming. Tony specializes in Intellectual Property litigation, including patent, trademark, and copyright litigation. He has considerable experience before the Court of Appeals for the Federal Circuit, and has handled patent and copyright litigation in China for multiple clients. He has developed a special expertise in patent claim construction and in right of publicity/First Amendment cases. Tony writes regular columns on IP law for Bench & Bar, as well as periodic articles for The Federal Lawyer, and gives talks on numerous IP issues. Prior to joining Merchant & Gould, Tony was a physics engineer at Argonne National Laboratory, where he was involved in numerous engineering projects associated with the study of nuclear physics. This industry experience has given him a practical exposure to technology that helps him in the practice of law, as well as an ability to relate well to his engineer and scientist clients. At Merchant & Gould, Tony serves on the benefits committee. He also does pro bono representation on behalf of women who are not receiving the alimony or child support awarded to them by the courts. Tony spends most of his off hours with his family, traveling, playing golf, and skiing. In 2017, Tony and a trial team from M&G obtained a $5 million jury verdict in favor of Proformance Manufacturing, Inc. The case involved patented window technology. In 2015-2017, Tony and a team from M&G represented Toro in three separate patent infringement actions. Following a favorable claim construction and reexaminations, all three cases settled favorably. In 2017, Tony successfully represented Terrybear Urns and Memorials in a trademark and trade dress case concerning urns and keepsakes. 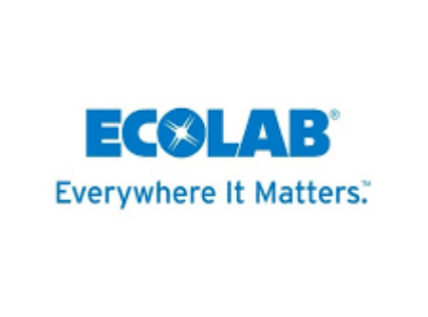 Beginning in 2014, Tony and a team from M&G represented Ecolab and its Nalco subsidiary in the enforcement of several patents covering chemical mixers. Also in 2014, Tony represented Lund, Inc. in two patent and trademark enforcement matters that resulted in business acquisitions. In 2013, Tony represented McMillan Electric in enforcement of two electric motor patents. The case turned on the construction of claim terms used to describe a complex electrical circuit. Tony was able to convince the defendant and its counsel that McMillan’s read of the patent would prevail in court. The case settled very favorably shortly thereafter. In 2013, Toro sued The Décor Group for infringement of several patents on landscape lighting. The Décor Group had been a former distributor of Toro lighting products that stopped purchasing from Toro and began importing and selling knock-offs from China. The settlement included a payment of Toro’s lost profits for all past sales and a consent judgment that includes an injunction and admission of validity. In 2012, Tony and a small team of M&G lawyers won summary judgment for their client on all claims by Michael Jordan, including right of publicity violations and trademark infringement. The district court agreed that M&G's client had engaged in speech protected by the First Amendment and dismissed all of Jordan's claims. In 2011, Tony and a small team from M&G successfully resolved a multi-patent, multi-trademark lawsuit in M&G's client's favor. 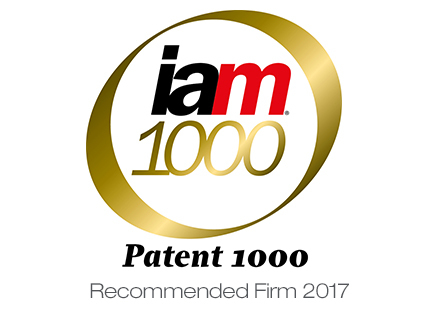 The client was the patent/trademark owner and asserted three of its patents and several trademarks against a competitor. The settlement included a consent judgment. Also in 2011, Tony successfully argued a claim construction for a M&G client accused of infringing 135 claims in five patents. Tony focused on a single claim limitation found in all 5 patents and demonstrated that the patent owner had disclaimed subject matter applicable to all asserted claims. In 2010, Tony and a team of M&G lawyers and paralegals successfully resolved a multi-patent, multi-court litigation for an industry-leading manufacturing client. The M&G team utilized reexamination of the adverse party's patents and as well as their client's patents to obtain a stay of the litigation and strengthen their client's position. The Patent Office later confirmed the patentability of M&G's client's patents, while rejecting the patentability of the competitor's patents. The case resolved favorably for M&G's client after the Patent Office decisions. Also in 2010, Tony represented an industry-leading electronics retailer in a trademark litigation against an online infringer. Tony was able to obtain a judgment for his client that not only transferred the defendant's domain name to Tony's client but also all of the defendant's phone numbers that had ever been associated with the infringing mark. In 2009, Tony and small team of M&G lawyers represented another game manufacturer in a trademark dispute with a former distributor who was counterfeiting. Tony was able to convince the court to grant his client a temporary restraining order and preliminary injunction to stop the infringing sales. The win was especially gratifying given that another court had earlier questioned the validity of the client's mark in a separate proceeding handled by a different law firm. In 2008, Tony was lead trial counsel on a patent infringement lawsuit against the world's largest game manufacturer. After a six-day trial, the jury returned a verdict and substantial monetary award in Tony's client's favor. Several years before a jury heard this case, Tony successfully argued an appeal to the Court of Appeals for the Federal Circuit to have reversed an incorrect ruling by the district court that had ended the case. 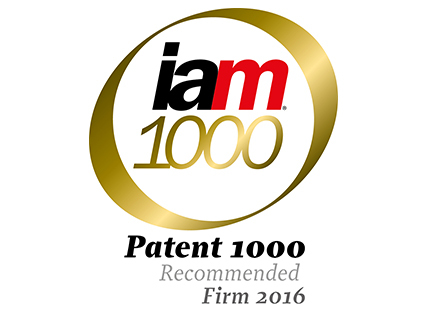 Tony has been lead counsel on a number of patent infringement lawsuits for a large manufacturer of turf equipment. One case was successfully tried to an arbitration panel resulting in an invalidity decision in Tony's client's favor. Another recent case involved a full-day Markman hearing - the result of which was that 8 of the 9 claim terms were construed in Tony's client's favor. Another full-day Markman hearing in 2008 with difficult issues resulted in a significant ruling in Tony's client's favor. In 2007, Tony was hired as co-lead counsel to replace a prominent Washington D.C. law firm on an inventorship dispute case against the world's largest DNA sequencing company. After taking several key depositions, and during the deposition of one of the defendant's founders, the case settled favorably for Tony's client. Also in 2007, Tony was hired as co-lead counsel to replace another law firm on a trademark infringement lawsuit against a prominent national retailer and a large international clothing manufacturer. Tony and his co-counsel were able to quickly put together a strong and credible position from which a very favorable settlement was quickly reached. Tony has been lead counsel on several patent infringement lawsuits for a major automotive parts manufacturer. All of the lawsuits (more than 6) have resulted in favorable outcomes for Tony's client. Tony has also been lead counsel for glass manufacturer from the Czech Republic. A recent case for this client resulted in a significant award of damages, enhanced damages and attorney's fees. 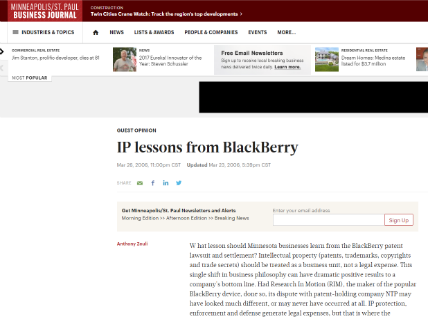 In 2006, Tony was co-counsel for a satellite manufacturer accused of patent infringement. After a five-day jury trial in Minneapolis, the patent was held invalid and the plaintiff recovered nothing. Tony represented three companies of the hundreds sued by the Lemelson Foundation for patent infringement concerning barcode scanners. When the claims were eventually dismissed against all three of Tony's clients, he was the only lawyer who brought a motion seeking the recovery of attorney's fees for his clients. Tony has successfully represented an international importer of crematory urns in several copyright infringement lawsuits. The most recent lawsuit resulted in a favorable stipulated judgment. 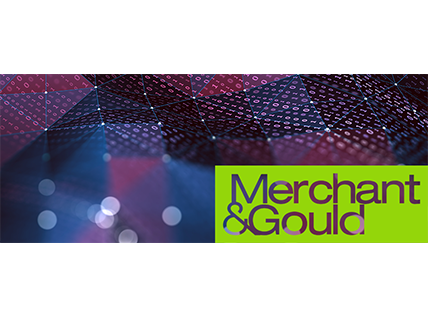 Tony and others at Merchant & Gould successfully represented an international telecommunications company in patent infringement litigation in China. It was one of the first patent infringement lawsuits brought by a U.S. company against a Chinese company under China's recently enacted patent reform laws. Tony and others at Merchant & Gould successfully tried a copyright infringement case to a jury in Minneapolis. The case involved two toy manufacturers at odds over a then-popular toy doll line. Business Unusual: What’s Needed to Own a Business Method? Six Merchant & Gould Attorneys Named 2007 Best Lawyers in America® by Woodward/White, Inc.